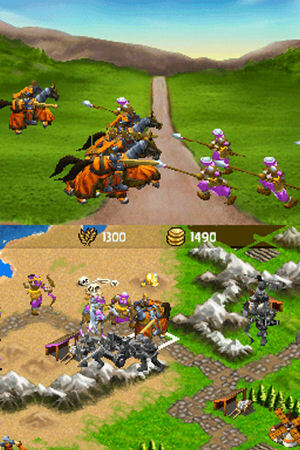 The game uses a unit counter model for its battles – cavalry are strong against foot soldiers, soldiers are strong against pikemen, and pikemen are strong against cavalry. Other factors are taken into consideration when resolving battles such as the terrain, any special unit bonuses, and the presence of special hero units. One you initiate a battle it is carried out automatically as you watch the action on the top screen and are given the final strengths of each unit after the battle. The real-time component may be gone, but there’s a lot of strategy in maneuvering your units and trying to set up advantageous match ups with the enemy units. The game comes packed with plenty of gameplay. First of all there are five different civilizations to play in the game and over 40 different types of units to command. There are plenty of maps and more can be unlocked by playing through the game’s three campaigns. Speaking of the campaigns, each is a series of missions that follows the exploits of a famous leader of the Middle Ages, Joan of Arc, Saladin, and Richard the Lionhearted. The Joan of Arc campaign also serves as the game’s tutorial and does an excellent job of teaching players how to play the game. This does not mean that it’s not a full-fledged campaign on its own – it certainly is and will provide you with some challenging gameplay for a learning experience. Each campaign mission is introduced by a handful of nicely illustrated static cutscenes that put the upcoming battle into historical perspective. The gameplay is challenging and provides a surprising amount of depth for a portable strategy game, but it also suffers from that portability. When battles begin to heat up you can have a fair number of units on the screen at a time. It can then start to become difficult to distinguish which unit is where which can lead to some strategic blunders. This is especially true during sieges, when you have to contend with animated burning buildings along with the crowd of units as you try to select your units and give them orders. While Age of Empires on the PC was elevated to its lofty status among strategy gamers in a large part due to its multiplayer play, the opposite is true on the DS. Multiplayer games can be played wirelessly, but you’ll end up spending a lot of time looking at your screen and wondering when your opponent will finish his or her turn. The game also supports alternating play with a single DS, which is actually a bit more preferable as you know exactly when your opponent has finished his or her turn. It might have a few minor annoyances, but overall Age of Empires is an enjoyable game that will provide you with many hours of good strategy gameplay on the go. In The End, This Game Hath Been Rated: 85%. The dawn of a new age of strategy gaming on the go.